On Wednesday 29 August 1928 he played for the Maher Cup against the champions of the south, Cootamundra. The farm was a little closer to the village of Gooloogong than Canowindra, but the latter was where most business was done – and Canowindra had a very good football team. Backed by the wealthy Grant families, it had developed into the best side in the Central-West. It was here that he learnt the game, from coach and former international Rex “Rocker” Norman (Worboys,p.22). The team were off to Coota, and many pundits thought they would win. Canowindra had their own Cup – the magnificent Jack Hore Memorial Challenge Cup. Donated to the Canowindra Rugby League in 1926 Made of gold it had cost £150, some £135 more than Ted Maher’s old tin pot (Sheehan,p.20). It even had a top, in the form of a sculptured athlete, hand on hip cradling his football. By 1928 there had been 25 matches fought for Canowindra’s cup – from Young, Orange Old Boys, Forbes, Carcoar, Mandurama, Grenfell, Cowra , Parkes, Eugowra, Wellington, Bathurst Waratahs and Yeoval. Only one of these was successful, one team, one time, Grenfell on 5 June 1927. And then Canowindra decisively took it back home again in the rematch. 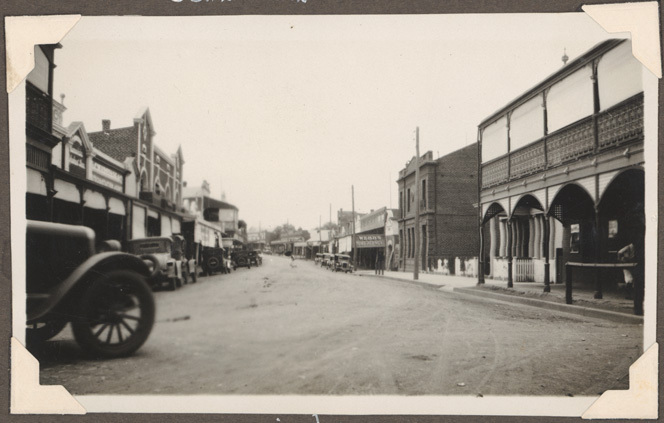 Wednesday 29 August 1928 was declared a holiday in Canowindra. An estimated one thousand supporters travelled by special train and motor vehicles from Group 11 and Jack Hore Country, into the heart of Group 9, to the centre of Maher Cup country, some 95 miles away, through Cowra, through Young and Wallendbeen to Fisher Oval, Cootamundra. This was only Canowindra’s second Maher Cup challenge. It was going to be their last. It was a battle between the champion sides of the west and of the the south, and to be fittingly prepared the visiting players had arrived in Coota on the Tuesday. They were ready. Yesterday the hosts of Canowindra overrun the land of Cootamundra, and there were lamentations of the conquered ones as they viewed the desolation that would come on the pubberies and hot-pie shops – by the wresting of the Maher Cup from the holders. With Canowindra it was ‘come one, come all’ . Mothers brought their babies and bullock bells; old pleasant-faced nonagenarians and grand-mas ; flapperettes and school boys — all were there. ‘We left nobody at home’, the Club secretary told us. The special train brought along 500 people, and probably another 500 came by cars. From Gundagai and surrounding centres big troops bolted to the scene of battle, but Coota folk were evidently not so strongly interested, as only £189 was taken at the gate, at 2/- per head. And how the visitors roared when charged 2/- for entrance money, but they should not have done so, because the game had plenty of ‘meat’ in it, and also blood, the sight of which caused timid females to shriek…. When excitement was at fever heat and supporters of Canowindra were carrying their heroes shoulder-high from the ground, there fell a bomb in the camp. The president of Canowindra F.C. was handed a protest from the Cootamundra representatives, alleging that R. Gilmore, one of their players, did not live, in the prescribed ten miles radius of Canowindra, as the rules demand. There was great consternation, and much bad feeling was engendered. Coota’s officials immediately went into committee, but the meeting did not end till nearly midnight. The final result was that the protest was upheld. Canowindra presented a signed declaration over the signature of Sergeant Morgan, that all their players were qualified. At the committee meeting the secretary, president, Gilmore, and Arthur Grant also signed statements which the Cootamundra committee desired. Gilmore says he will sign any affidavit to the effect that he compiled with every requirement. He states that he had always played for Canowindra, and had been in the side regularly for three years. He played against the Englishmen at Parkes, as a Canowindra representative, and again in the Far West team in Sydney during Country Week. Rex Norman (Coota’s coach [should read Canowindra’s coach]) claims that he has taught Gilmore the game, and he has not played elsewhere, except in scratch games. It was suggested that the Cup be handed over under protest. Coota’s players, and followers, were in accord with this suggestion, but the committee refused. They aver that Gilmore lives with his parents about eleven miles out of Canowindra. Gilmore says he does not live at home. For the past few months he has lived with Mr. A. Grant, right in the township. There is no other team for which he is able to play, and if he did not play with Canowindra he could not play at all. It seems like splitting straws, and this is not in the best interests of the game. Undoubtedly, Cup argument or no, Canowindra played their usual and regular side, as did Cootamundra. The latter were well and truly beaten. It would have been a graceful act to have given Canowindra the Cup and created a better feeling’. ‘We, the Judiciary Committee of Group 9, find that R. H. Gilmore’s place of residence is on a 604 acre block of land, settlement purchase, situated 12 miles by road from Canowindra, and that the Canowindra Club, by playing the said Gilmore, committed a breach of Rule 4 of the Maher Cup rules, which states that players must reside within a ten mile radius of their Club or, failing that, get a permit to play.’ The appeal was, therefore, dismissed. Last week I was informed by Cootamundra’s secretary that a notice of motion was on Cootamundra books to the effect that should any club outside Group 9 be holding this cup at the end of the season they would have to hand it back to Cootamundra, and that no team outside Group 9 could play for the Maher Cup next season. I ask any sporting body, whilst smiling at this absurd and bushranging action, would any other club but Cootamundra do such a thing. The whole thing boiled down to this: Cootamundra knows that they have no chance of defeating Canowindra, and they will do all possible to keep the cup out of Canowindra’s hands; but after this is made public and broadcasted, unless Canowindra are given the cup which they won genuinely it will be the end of the Maher Cup, as all football clubs with any sportsmanship in them would not bother mixing with such class of sports. Cootamundra did not even pay Canowindra the courtesy of the usual banquet. ‘It seems hard that a player, who was born and bred in the district, is not considered eligible to play for his home town, whilst paid coaches from Sydney are proclaimed as being residents. Cootamundra played five imported men: Latchem Robinson, Phillips, McFadden, Torpy and Faunce. These men will probably leave Cootamundra in a few weeks time, while Gilmore will be still working on his property, but, according to Cootamundra rules, is not eligible to play football. Gilmore admits having the property, but, as it is not yet sufficiently developed, he obtains work wherever he can round about him, and claims that he has been living in town, at the residence of Mr. Arthur Grant, for much longer than the required 28 days. Canowindra never played for the Maher Cup again. Roddy Gilmore contined to farm at North Bangaroo, and played for his home town until late into the thirties. The Jack Hore Cup, remained very popular for another decade, attracting crowds of 4000 during the Depression (Worboys, p.26). Canowindra held it for another two years until taken south by Eric Weissel’s Temora. Coota won eight more Maher Cup challenges, before likewise falling to Temora. They never dared to challenge for the Jack Hore. Their own supporters took time to get over the on-field drubbing and what must have been for many Coota sporting people a profound off-field embarrassment. Only a few hundred turned up for their next two challenges. This incident in my opinion set the tone for “The Win, Tug and Wrangle Cup” games from then on. The people who craved the cup continued to ignore the basic principles of sportsmanship. Those smitten likewise adopted gamesmanship as the guiding principle. It all became quite undignified, but never dull. It also set the tone for the parochialism and provincialism of Maher Cup football. Over the years interest was expressed far and wide to compete – from towns such as Leeton, Griffith, Yass and Queanbeyan for example. But, until things got desperate in the 1960s outsiders were not welcomed again in Maher Cup Country. Better to be a big fish in a small pond. ‘North Bangaroo Sub-Division’ (1924). Sydney Morning Herald, 22 August 1924, p.7. Available at http://nla.gov.au/nla.news-article16172740? ‘Challenge for Coota’ (1926). Gundagai Times, 13 August 1926, p.2. Available at http://nla.gov.au/nla.news-article123460235? ‘Maher Cup: wealthy footballers’ (1928) The Arrow, 24 August 1928, p.11. Available at http://nla.gov.au/nla.news-article103460329? ‘Today’s Maher Cup Match’ (1928) The Referee, 29 August 1928, p.9. Available at http://nla.gov.au/nla.news-article127899796? ‘A Debacle at Coota’ (1928) Gundagai Independent, 30 August 1928, p.2. Available at http://nla.gov.au/nla.news-article130882160? Frazer, W.H. (1928). ‘Canowindra’s Case’. Gundagai Independent, 3 September 1928, p.2. Available at http://nla.gov.au/nla.news-article130881147? ‘Maher Cup Squabble’ (1928) The Referee, 5 September 1928, p.12. Available at http://nla.gov.au/nla.news-article127903026? ‘The Cup Dispute’ (1928). Gundagai Independent, 6 September, 1928, p. 3. Available at http://nla.gov.au/nla.news-article130881212? Spencer, C.S. (1928). ‘Maher Cup Dispute’. The Arrow, 7 September 1928, p.16. Available at http://nla.gov.au/nla.news-article103456364? ‘Cootamundra Football Club Caricatured’ (1928) Grenfell Record, 17 September 1928, p.3 Reprinted from Canowindra Star. Available at http://nla.gov.au/nla.news-article115906011? ‘Wagga Wants to Join Group 9’ (1949) Burrowa News 25 February 1949, p.9. Available at http://nla.gov.au/nla.news-article102806871? Sheehan, M.V. (1963). The Maher Cup Story. Worboys, R. (1992) Jack Hore Memorial Cup: a brief history. Canowindra and District Historical Society. This entry was posted in Matches and tagged Canowindra, Cootamundra, Protests, Rod Gilmore. Bookmark the permalink.